Chinese smartphone maker ZTE launched a sleek, U.S.-bound flagship phone – the AXON 7. The latest addition to the series, which features handsets like the AXON Mini (review) and AXON Pro (review) sees ZTE partner up with Designworks to execute an elaborate vision for its look and feel. 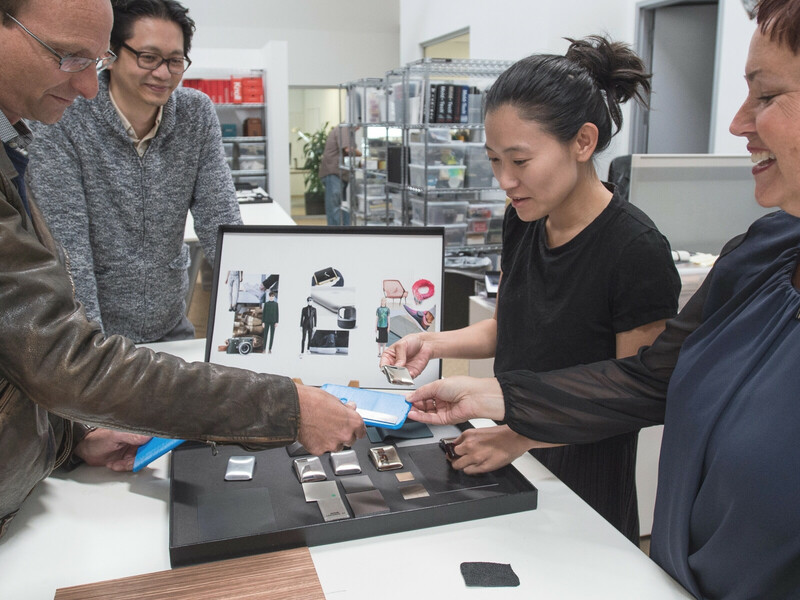 The design studio, which collaborated with BMW, Mini, Rolls Royce, and other big names from various industries, helped ZTE keep the AXON 7 "pure and simple" – made of aluminum, its body is devoid of sharp edges, thin, and ergonomic. The phone has its fingerprint sensor positioned on the back because ZTE and Designworks found that users risk dropping their phones when logging in with their thumbs, and added haptic feedback to the recess around the sensor. Moreover, the elegant handset boasts a dual speaker layout that's been accented upon with symmetrical grills on the phone's top and bottom sides. The package is finished off with jewel-like colors – 'Ion Gold' and 'Quartz Gray' – which have been inspired by handmade watches. ZTE and Designworks worked on a standout look for the AXON 7. Being ZTE's new flagship device, the AXON 7 is spec'd out beyond compromise. Featuring a 5.5-inch, Quad-HD AMOLED screen, the Android 6.0.1-running device is powered by Qualcomm's premium-tier Snapdragon 820 chip, paired with either 4GB RAM and 64GB of storage, or a whopping 6GB of RAM and 128GB of memory. The smartphone is equipped with an USB 3.0 Type-C port for fast data transfer and convenient plugging in and out. It is also among the first devices to support 'Daydream', Google's mobile virtual reality engine. Moving to the camera setup, a 20MP main camera with a Samsung ISOCELL sensor and an 8MP front cam will face your photography needs.The rear camera comes with a plethora of extras, including OIS+, EIS+, PDAF, a wide F/1.8 aperture, and a dual-LED flash. It can also record 30FPS videos in up to 4K resolution, along with 720p resolution/240FPS slow motion reels. The house is ran by a 3140mAh battery, and those dual speakers should be put to good use by the dedicated 24-bit/96KHz DAC and stereo amplifier. There's also voice recognition tech by Nuance on-board to round things off. Looking svelte and spec'd up to the brim, the AXON 7 carries the ambition to become a breakthrough ZTE product for America. Headed to stores with an aggressive sub-$500 price tag, the phone will be sold with a 2-year limited warranty (serviced locally in the U.S., complete with call center support) and Axon Passport Program, a premium protection plan for owners. ZTE says the phone will be available in its ZTE America web store, as well as Amazon, Best Buy, B&H, eBay, and Newegg. At launch, the AXON 7 will be compatible with AT&T and T-Mobile's networks, while Sprint and Verizon support is possibly coming later in the year. May 17, 2016, 4:26 PM, by Stephen S.
Mar 30, 2016, 11:53 AM, by Ben R.
China are taking the smartphone market over. Nova launcher is your friend. Agree with you. I saw a couple of China phone full of bloatware. BUT ZTE Axon is very light weight targeted at American market that hate bloatware. that explains your "on contract" phones! Yep. They also have bad track record of updates. If ZTE can guarantee updates to 2-3 full versions of Android that would be perfect. The only other issue is the small battery. For me, 3000mah is too small for me by current standards, especially when something like the Ulefone Power can fit a 6050mah battery into a 9.5mm thin phone. Hmm my Axon Pro got updated to marshmallow and 6.0.1 faster than Samsung etc updated any of their abandoned product. I can't speak for other zte phones but my axon pro from 2015 beats the crap out of my Samsung Note in camera and headphone audio and updates. My only caveat is Samsung handily has better battery performance. Why 7 though? Where the heck is Axon 2-6? Cons for an iPhone: It's an iPhone! Again, another beautiful design and monster spec ruined by puny battery. It may be oled but 3140mah is small for 5.5" flagship these days. Though, good overall design especially the front facing speakers. I am impressed with those grills. SD 820 has been doing pretty good for battery life. The last Axon model got average battery life with the SD810 and 3000mah battery. This is a slightly large battery with much better internals. I wouldn't be too worried. A bigger battery would've been nice but 3140mah isn't tiny. Maybe I'm just too spoiled with my s7 edge battery life. But axon 7 looks very good. Gonna buy one if they release an international version. Nice. May just make me breakdown and get a phablet. Funny how they hired Designworks to essentially design an evolutionized HTC One. Still looks nice though. ZTE has been following this design for long. Moreover, saying that one phone looks like another is pretty done with. There are only a few mainstream designs that all others follow. and this type of design was started by HTC so its logical to say its look like one. Might not happen. Waited for an axon in my country last year and they only released it in U.S. But better design than iphone and lg g5 yes? See androidauthority, John Velasco placed it side by side. To be fair, there are tons of phones that look better than the G5. That's not exactly a high bar.